James Coplan, M.D., Neurodevelopmental Pediatrician, Author and Speaker » Blog Archive » Dr. Coplan continues his discussion based a reading of Steve Silberman’s Neurotribes: The legacy of autism and the future of neurodiversity. Dr. Coplan continues his discussion based a reading of Steve Silberman’s Neurotribes: The legacy of autism and the future of neurodiversity. Asperger’s Syndrome has typically been viewed by medical professionals and the lay community alike as milder than Kanner type autism. The fact that the American Psychiatric Association has purged the term Asperger Syndrome from the lexicon doesn’t solve the fundamental problem, i.e. what are we talking about when we use either of these terms? What is the full extent of the condition, and where is the boundary with “normal” (if such a boundary exists)? Silberman constructs a narrative with two opposite, but complementary poles: On the one hand, Kanner (and his allies within the American psychiatric community) sought to depict autism as a rare, severe disorder. On the other hand, Asperger’s work – when it was belatedly acknowledged many decades later – was always pigeonholed as dealing with bright, hyperverbal “little professors.” We will get back to Kanner in a future post. For now, let’s focus on Asperger. Asperger practiced in Nazi-occupied Europe. 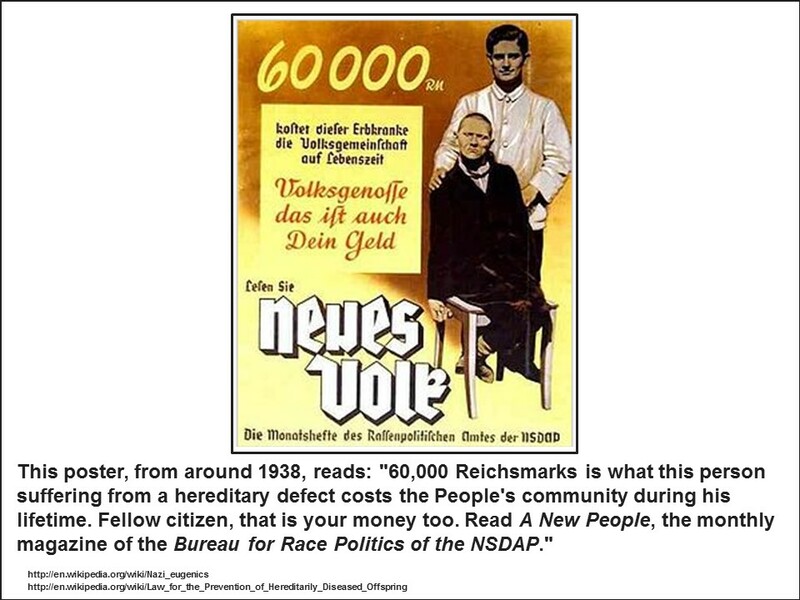 Medicine under the Nazis was transformed from a healing profession to an arm of the state intent on improving the health of the Volk – “The People,” based on principles of Eugenics. 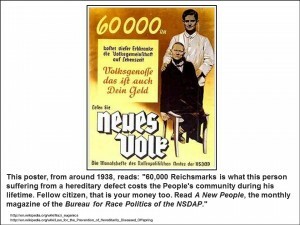 Eugenics theories were popular in this country as well, but Hitler was the first person to put these theories into practice on a national scale. In 1939, Hitler implemented Aktion T4 (cryptically named for the building in which the policy had been formulated: Tiergartenstrasse 4), a program of forced extermination of persons deemed undesirable by virtue of age or disability. The program ran from 1939 to 1941, resulted in the deaths of approximately 70,000 “useless eaters” (the Nazi term), and served as a test-bed for perfecting the industrial apparatus that became the Holocaust. None of this happened overnight. Rather, the noose was tightened bit by bit. First, Jewish physicians (and there were many) were forced out of their profession. Then, leadership of academic institutions was handed over to hand-picked Nazi sympathizers. Only after this groundwork had been laid, were T4 and the other atrocities put into place. By that point, the entire ethos of medicine had been subverted from within. How would Asperger have reacted to all of this? To put it mildly, Nazi Germany was not a good place to pursue a career dedicated to helping children with disabilities. Based on the few records that survived the war, and various statements by Asperger himself, Silberman concludes that Asperger selectively emphasized only the higher-functioning of his patients, while downplaying the others, so as not to draw the attention of his Nazi superiors. To have spoken publicly about the full spectrum of the children he was treating would have invited a visit from the Death Squad – for his young patients, and perhaps for himself as well (although he was Christian, and hence not a target of the Final Solution, he was under scrutiny by Nazi officials, and apparently only the intercession of his boss saved Asperger from being arrested). So one thread of the story – the assumption that Asperger’s Syndrome is uniformly mild, and refers to high-functioning, hyperverbal children – is only partly true. By common usage, that is the meaning the term has taken on. But what was in Asperger’s mind at the beginning seems to have been something much broader than that. Asperger was under scrutiny by the Nazi regime, and risked arrest.